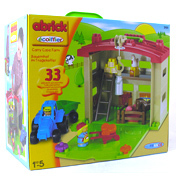 This range of construction toys is called Abrick Ecoiffier (not the easiest one to pronounce we do agree!) and is brought to you by the UK toy firm Mookie, who are based just outside London. 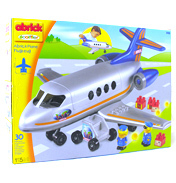 Abrick Ecoiffier is a collection of toys which are aimed at preschoolers and they are a bit of a cross between Lego Duplo and Playmobil in that each set has a series of parts to be assembled, which fit together, some of which are brick like. In several sets there is an element of initial assembly required by adults but other pieces can be fitted together, and moved around by small hands, indeed the bricks are so designed as to be handled by early learners as you might imagine. The product range includes basic brick boxes as well as the more intricate play-sets with themes such as the Farm Play set which is based in a farm yard and the Pirate Set which does of course include a pirate ship and the House, Plane and Helicopter sets are also popular. One of the more attractive elements of these sets are the inclusion of little figures or characters which fit in with the relevant theme and these can be moved around the models once assembled to provide hours of entertainment and acting out fun. Both these little people and the bricks are appropriately sized so small hands find them easy and fun to handle. Overall we would say that these sets are perhaps not quite as robust as those other top brands however this is reflected in the pricing as this range makes an excellent good value alternative, and still they are sturdy enough for continued play. 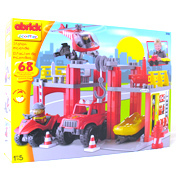 Make someone smile today with the play sets from Abrick Ecoiffier.